Live on a boat instead of a hotel? With a family? Malia Frame was skeptical — and then she tried it. And liked it so much she went back. Here's her guide to the best aquatic road trip around the British Virgin Islands. 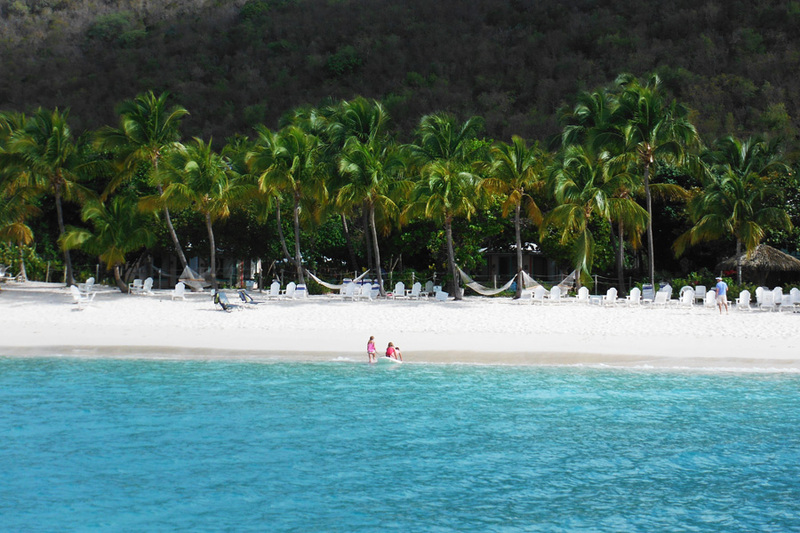 BRITISH VIRGIN ISLANDS – Let's just say I am not a boat person. I'm happy to go out for the occasional afternoon and float around here and there, maybe have a drink on board and take in some scenery. But I am always happy to be back on solid ground. Given my landlubber tendencies, you can imagine my reaction when my husband and brother-in-law proposed that our families spend our week-long spring break on a 60-foot boat. "Yes, a boat. Yes, it's only 60 feet, but in the boat world, that's actually very large! Yes, it will have a crew that will drive and cook and, yes, of course there are toilets on board." All these words were being spoken to me, but none were computing. How could I get my head around a week on a… miniature…floating…hotel? After we checked out a few charter websites, my seven-year-old son began calling our preferred vessel a "living boat." But from the pictures I saw, I was worried that what was online was too good to be true and that we would end up filing a complaint with the Better Business Bureau instead of bragging about our perfect Caribbean vacation. Peter Island, the promises of shore aplenty. We persevered with our research. I kept focusing on the fact that we'd be in the stunning British Virgin Islands where sun and sand abound, and there is shore aplenty. I was so thrilled about the location that I kept most of my misgivings to myself. But as we got closer to committing, so many things made me sweat. What if the weather sucked? Would we be banished to seven days and nights in a cramped, mildew-ridden cabin? Where would I put my clothes? Would I be seasick? If so, would I be throwing up too much to enjoy food and alcohol? And perhaps most daunting: The. Toilet. Situation. When the time came to leave, I was nervous. I had my Ambien packed and my iPad stocked with every mindless Kardashian show imaginable so that when I had to retreat to my matchbox-sized room after dinner, claustrophobia wouldn't overtake me. Here's what happened: We did the trip, and it was spectacular. We had an amazing crew, Jodi and Ian, whose warmth, humor, knowledge of the area (Ian), and cooking (Jody) made every day so special. A week was the right amount of time to relax and get on island time. The trip so exceeded my expectations that I didn't take any notes. The proof that we loved it so much: We went back again. Only this time, I documented every moment of our journey as any proper writer would, in hopes of sharing it with other boat-fearing travelers like myself. 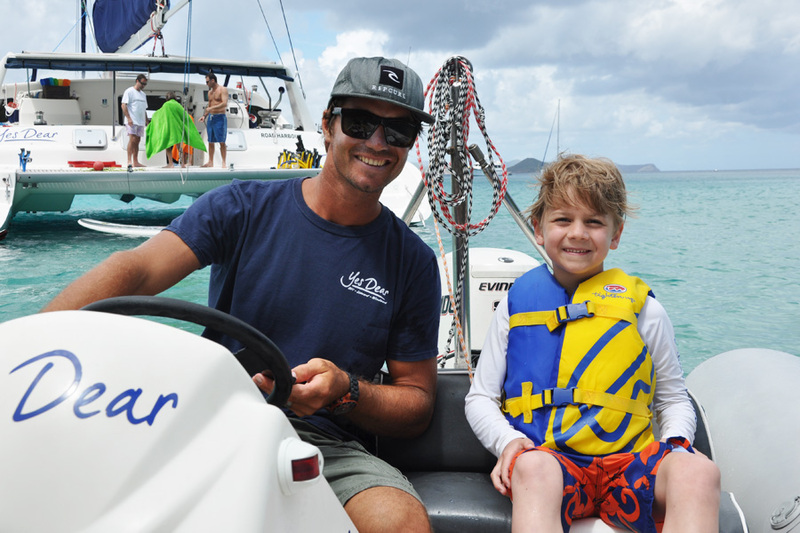 The BVIs are a perfect location for a first family charter and newer boaters hoping to get a taste of boat life without over-committing. The nature of the archipelago means that you are never out of close proximity to land, and many coves and inlets allow for anchoring and overnighting. In other words, it's Boating Lite. A lovely, fun, amazing South African couple, Richard and Adele Smit, were the crew for our second trip. As we settled in, I reconnected with the jaw-dropping scenery around me: water the color of my favorite turquoise necklace, lush green palm trees, a shiny blue sky, a fresh balmy breeze, lush and majestic mountains surrounding us. Richard takes Malia's son out for water sports. One of the best parts about renting your own charter is that you dictate the schedule, route, and daily activities — or lack thereof. If you're worried about being trapped in a small space all day without room to move, don't be. We opted to have our own water sports hour every afternoon. We paddle boarded, sea kayaked, jet skied, snorkeled, and swam. On our first night, we sat with Richard and Adele and plotted our course while feasting on Adele's amazing culinary feats. Here are the highlights of our aquatic road trip. We spent our first afternoon and night tubing, snorkeling, and unwinding. After 24 hours, I began to relax. We had sublime cocktails on the deck looking out at the shimmering water. When night fell, we were mesmerized by the giant tarpon fish that swirled in the sea off our stern. 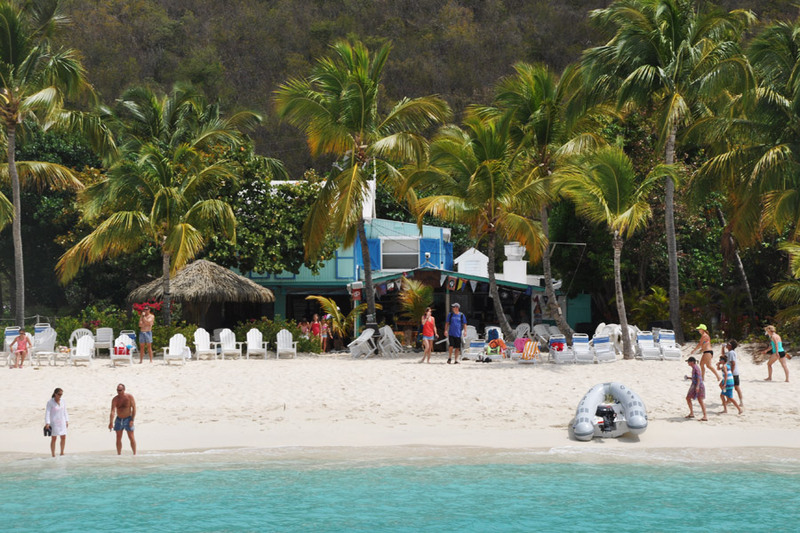 We docked in Deadman's Bay, home to the famous . It was so beautiful and peaceful that I was tempted to stay a night or two and meet the boat later. My sister-in-law and I had massages; the guys went to the beach with the kids and had a drink at the postcard-esque beachside bar. , a stunning locale and seaside bar, is easily one of the most magical places I've ever had a cocktail. You need to arrive by 3 p.m. if you want to get a good mooring and snag a cozy beachside sofa. We were a bit late for that, but it didn't matter. They also have a restaurant adjoining the bar that serves lunch and dinner. Make reservations by noon the day of to get in. After drinks, we climbed back aboard Yes Dear and headed to Salt Island to anchor for the night. The site where the famous Royal Mail Ship, the RMS Rhone, sank in 1867, it's now a popular wreck diving site. 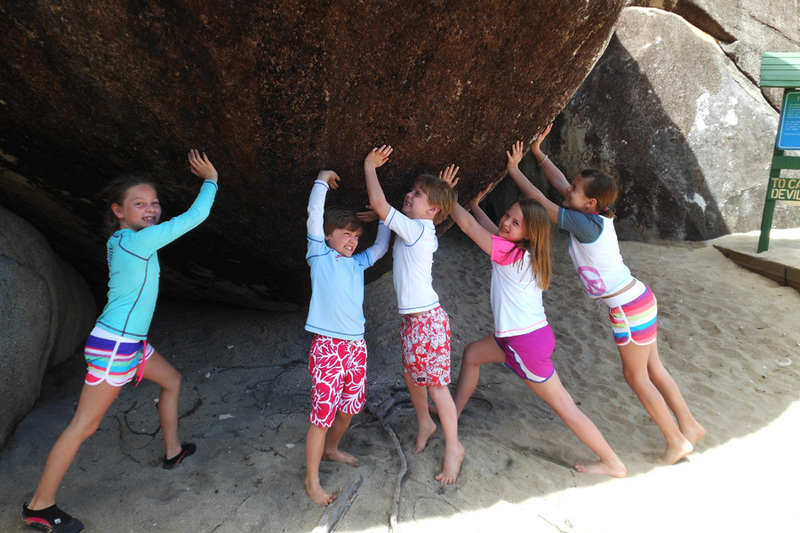 Malia's kids and their cousins test their strength at the Baths. Allegedly, Christopher Columbus gave the name Virgin Gorda — "fat virgin" — to the island because its profile on the horizon looks like that of a fat woman lying on her side. I won't comment on that, but we did have a great time going ashore and walking through , the enormous volcanic granite rocks. A 20-minute craggy maze led us through scenic grottos, up and through a rocky landscape. We hit this spot halfway through our trip, and it was simply the quietest, most pristine beach I have ever seen. The sand was pure, creamy silk. We swam in the warm water and hunted for sea biscuits and sand dollars. Pure heaven. 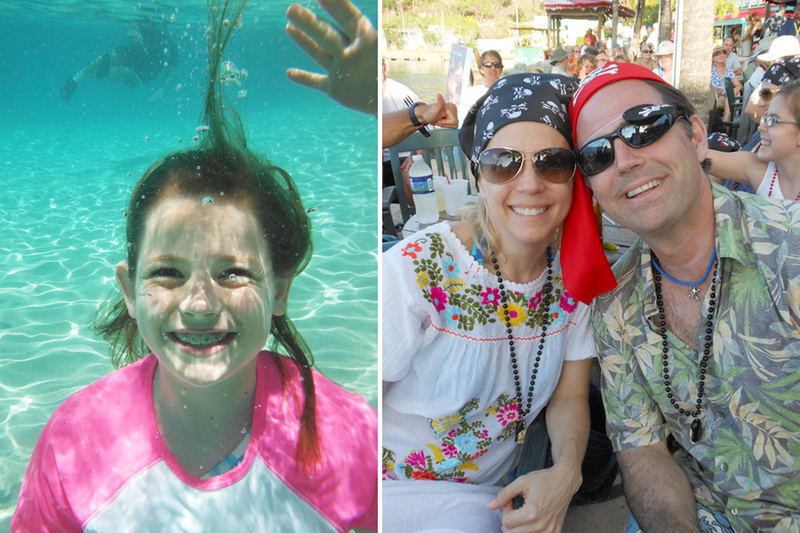 Malia's daughter hunts for sand dollars; Malia and her husband catch a pirate show. Less relaxing than the aforementioned places, the on Virgin Gorda draws a crowd for a chatty, well known pirate show by island legend . Called — wait for it — "Happy Arrr." This show was the highlight of the entire trip for my husband. After coming the first time, we realized only the rookies don't dress up. 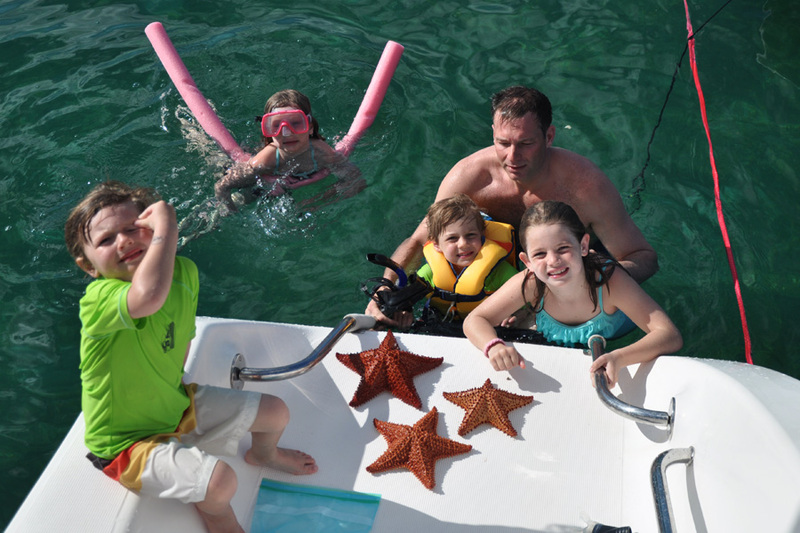 We had a laid-back day snorkeling and looking for starfish, which were as plentiful as stars on a clear night. Plunder from an afternoon out starfish hunting. 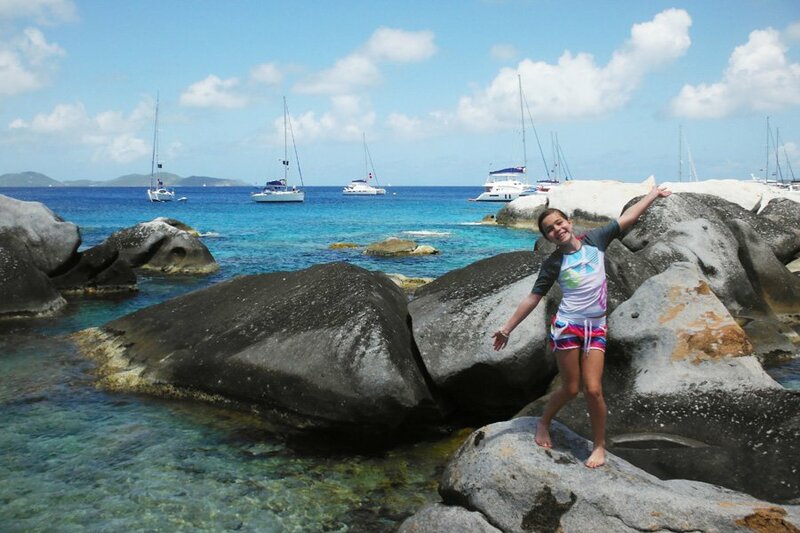 We found an amazingly scenic cove on the northwestern end of Virgin Gorda. The kids had a ball wakeboarding and kayaking. Snorkeling partners included porcupine fish, cuttlefish, parrot and rainbow fish, and a spotted featherduster. We had the serendipitous luck to have a family of stingrays visit our boat, along with more tarpon and "Barry," the resident barricuda. Sail downwind past The Dog Islands (all part of National Parks) to Guana Island (which is even more exclusive than the coveted Necker Island) to Monkey Point on Tortola, a spectacular snorkeling spot. We tested the waters by literally having to swim through massive schools of tarpon, which scared my daughter out of her wits. Bustling was where we decided to venture onto land. When you need a night of adventure ashore, this is the place. Richard and Adele agreed to babysit our kids while we went for a drink in the hills at the , where sunset happy hour runs from 4-6 p.m. and the pina coladas are amazing. We had a fantastic dinner at , a converted old stone sugar mill, that harkens back to Colonial times. It was nice to be on land for a bit and cool to dine amidst ruins. It was our most luxurious dining experience yet, but I still missed Adele's cooking. Spend a day at Sandy Cay exploring the hilly island, then head to nearby for a swim with large sea turtles and, if you're lucky like us, a huge stingray. Land ahoy! Soggy Dollar Bar. Another great night spot. We anchored in early afternoon, and things got a bit blurry after we went ashore to the famous and had several Painkillers, the house specialty. The trip culminated at , on the west end of Tortola. Strolling ashore and shopping the fun, waterside boutiques and relaxing at the bar has become a mini-tradition for us, if something you've done twice can be counted a tradition. My favorite store, sells tasty island seasonings that make great gifts—Herb Pepper and Caribbee Hot Sauce are their bestsellers. Sadly, ours got confiscated as we flew home, but that is the subject of another piece. We've already booked Yes Dear for April 2014. Most BVI boat charters leave from Road Town, Tortola. While you can fly to Tortola, it is not an airport served by many direct flights from the United States mainland. The is to fly to US Virgin Island St. Thomas and take a one-hour ferry ride to Road Town Harbor. There are two ways to do this, and we tried both. Private water taxies are expensive, but reliable; are less expensive and unreliable. The ferry depot is a short 10-minute taxi ride from the airport (plenty of taxis line up out front) and the ferries run frequently, so no need to book in advance. The third option is to fly to San Juan and schedule an air taxi from San Juan right to Tortola. To avoid a BVI Turnover Saturday "travel experience" (as my dad has dubbed any hellish travel day), plan to arrive at the airport more than three hours before your scheduled departure time. This may seem extreme, but it's not. is a freelance writer and mother of three living in New Canaan, Connecticut. She travels for the change of scenery and the bliss of food, culture, exploring, sport, art, and shopping.